Shirley Hunt makes herself known in the San Francisco Bay Area and beyond as a rising star in the field of historical performance. Ms. Hunt performs on baroque cello and viola da gamba with Philharmonia Baroque Orchestra, the American Bach Soloists, Archetti, Agave Baroque, Musica Angelica, Bach Collegium San Diego, and Sonoma Bach. Other recent engagements include performances with Portland Baroque Orchestra, Musica Pacifica, San Francisco Renaissance Voices, Berkeley Opera, and Faire Violls. 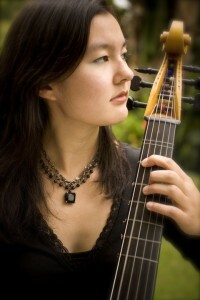 In 2010 Ms. Hun was selected as a Voices of Music Young Artist through a competitive audition process. 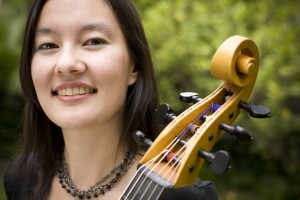 She co-directs the award-winning young ensemble, Agave Baroqe, which specializes in 17th-Century music for violin, gamba, and a lush continuo band. To learn more, visit www.shirleyhunt.net. Ms. Hunt performs on a c.1725 bass viola da gamba by Johann Christian Hoffmann, who was born in Leipzig in 1683 and died 1750. He was considered one of the finest luthiers in Germany and held the position of Royal Polish and Electoral Saxon Court Instrument and Lute Maker. J.S. Bach worked closely with Hoffmann on the design and construction of a number of instruments used at St. Thomas’ and St. Nicholas’; it is highly likely that this particular viola da gamba was played in original performances of Bach’s cantatas and Passions. Hoffmann included Bach among the beneficiaries of his estate, and when Hoffmann died in January of 1750, Bach passed along his portion (an unspecified musical instrument) to his second youngest son, Johann Christoph Friedrich, who at age seventeen was just beginning his first appointment as court musician in Schaumburg-Lippe. The Heyer Collection at the University of Leipzig contains many fine examples of Hoffmann’s work including two theorbos, dated 1720 and 1725; two viola da gambas dated 1731; a viola d’amore dated 1730; a viola da spalla dated 1737; two violas pomposa dated 1732 and 1741; and a cello piccolo. This entry was posted in Events, Music and tagged baroque cello, Concert, Events, Fundraiser, Johann Christian Hoffmann, luthier, Music, Shirley Hunt, viola da gamba. Bookmark the permalink.